By Shaunna Evans 9 Comments · This content may contain affiliate links. Sensory bins are so engaging for toddlers and preschoolers. 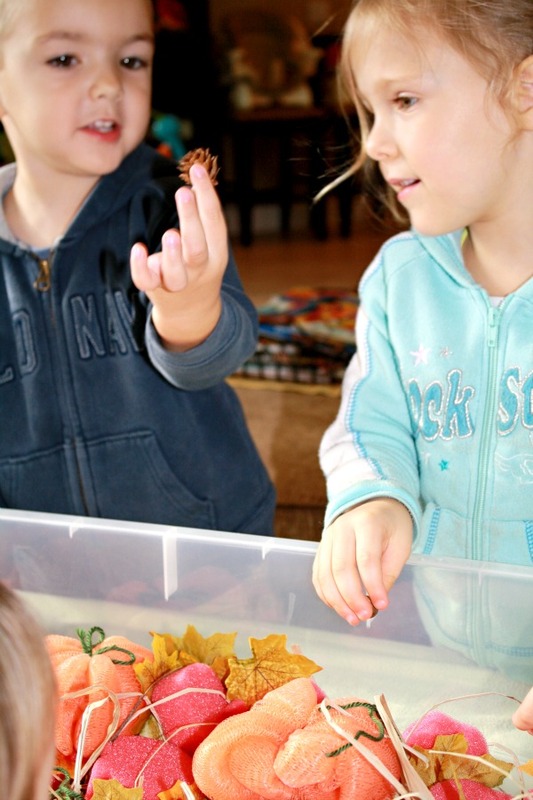 For our fall theme activities we’re bringing back our fall sensory bin. We’ll start by using it for open-ended sensory exploration, and then we’ll be using it for some learning activities in the coming weeks. These are photos of last year’s bin after we assembled it. I’m looking forward to seeing how the kids explore and interact with these same materials now that they are all a year older. Exploring: This first week we introduce a new seasonal sensory bin the kids spend a lot of time freely exploring the contents of the bin. I simply leave the bin out for the kids to explore on their own. 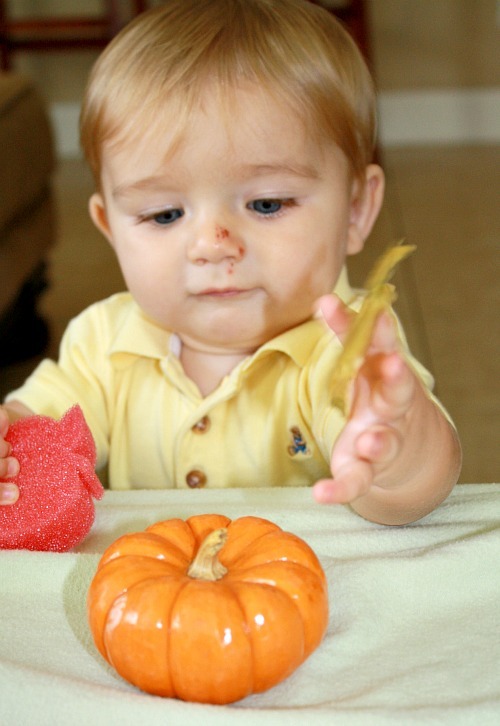 This self-directed learning and sensory exploration is the primary focus of sensory bins. The kids will feel the different textures, smell the scents, and observe the objects. During this time I will also watch to see what they are naturally doing with the objects so I can decide which activities we might do next. After a week I will start using some of the options below to extending the use of the sensory bin and incorporate some of our specific learning skills. These are more adult-directed than free exploration, but they will allow us to focus on the kids’ specific goals. Name objects in the bin for toddlers and ask them to locate the objects. As they are able, ask toddlers to pick up an object and name it. Name the colors of objects in the bin. Play “I Spy” with preschoolers by describing an object using its physical description (color, shape, size, texture). Smell the scented items. Talk about what those scents remind you of. Make up a story using some of the items in the sensory bin. Choose a kind of object. Find all of those items in the sensory bin. Count how many in all. Choose two different kinds of objects. Find all of those items in the sensory bin. Count how many of each. Then compare the two numbers (more, less, the same). Roll a number cube (with either dots, numbers, or number words). Find that many objects. Roll a number cube. Decide what number is one more than the number rolled. Then find that many objects. Roll a number cube. Decide what number is one less than the number rolled. Then find that many objects. Select some of the objects and make a pattern. If your child is just beginning patterning, make a pattern for the child. Then ask him or her to copy it or extend the pattern. 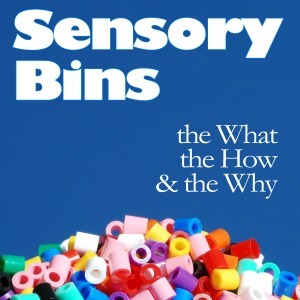 If you are looking for more information about getting started with sensory bins, you might enjoy Sensory Bins: The What, The How, & The Why. The book includes idea lists, storage and money saving tips, information on using sensory bins with Sensory Processing Disorder, and helpful recipes. It’s especially helpful if you are just getting started with sensory bins and want to know where to begin! so cute! 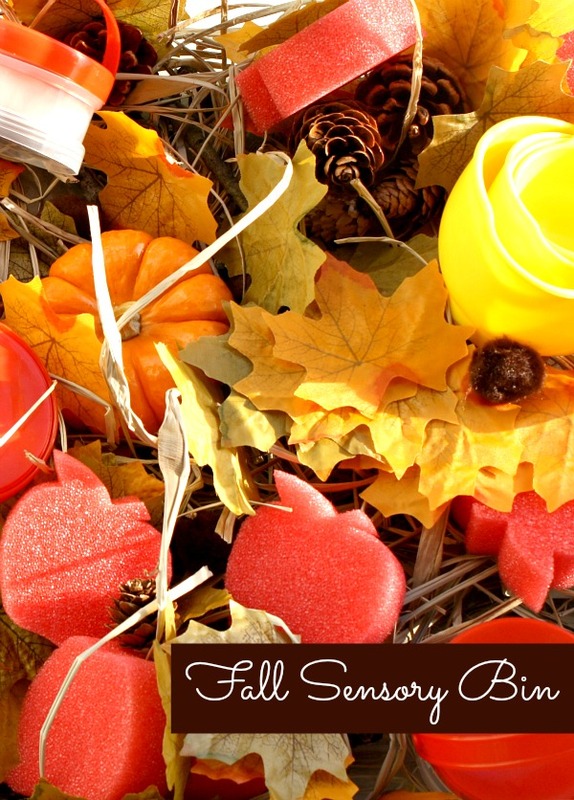 feel free to post to the Fall Crafts Blog Hop today! I love this sensory bin! It’s filled with color, texture, smell…can’t wait to make one of our own. Thanks for the idea! Thank you! 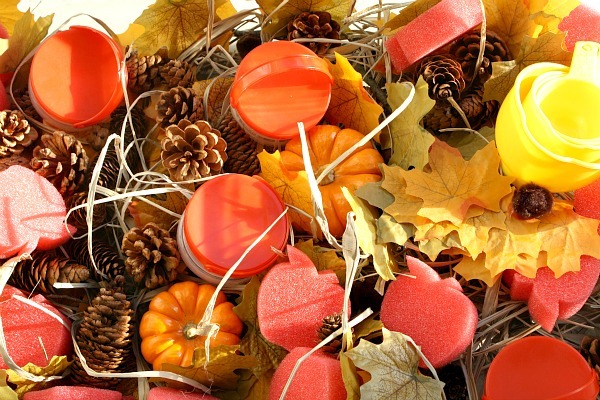 I think this is one of my favorites…may be that I love fall, but still! Love this! So colorful and full of texture. And what wonderful extension activities! Thanks, Stephanie! This is one of my favorite bins. I love all of the scents and textures.